I’ve been wondering about this book since the last issue, and it’s sort of a new feeling! I want to know what’s up with Barbara’s psychedelic chip trips and the murders being pinned on Grotesque. 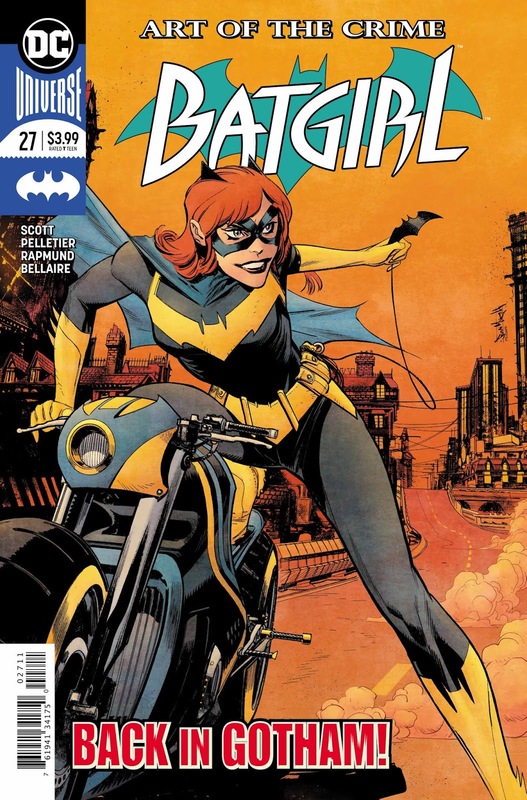 And maybe we’ll find out all about it, in my review of Batgirl #27! Stranger things have happened. 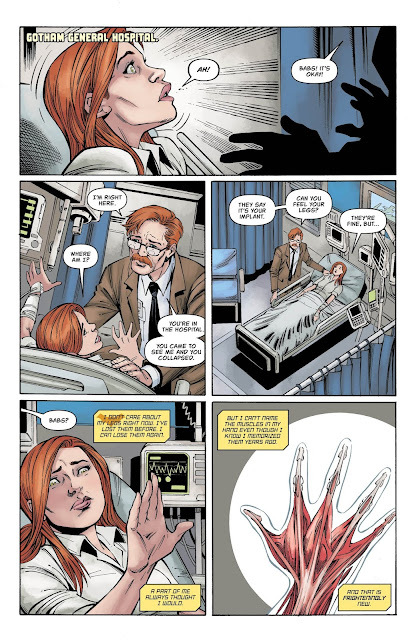 Barbara wakes up in the hospital after having collapsed at the GCPD, which is actually a good outcome, all things considered. Everything’s been wonky for Barbara ever since she confronted Grotesque at his apartment building and he threw he from a really high window. Maybe. She’s not quite sure what’s happened, partly because the spinal chip that allows her to walk is on the fritz. Her dad has ordered a new part from Best Buy, but it’s going to be three weeks before they get it. And Babs doesn’t feel like she has that long to lie around and wait. 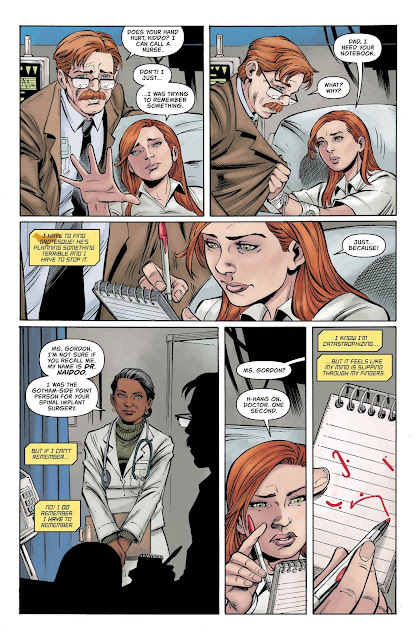 After writing a note for Batman in shorthand, which she knows only he will be able to read, Barbara is discharged into her father’s care, at her childhood home in Gotham City. She reminisces for a bit, and even acts like a petulant child to her father for old time’s sake, then Barbara grabs a prototype Batgirl costume that looks pretty classic and heads out into the city night to look up some properties tied to Grotesque. She eventually finds an address where Phillipe Rianne—the one known as Grotesque—is dead and stuffed into a refrigerator. 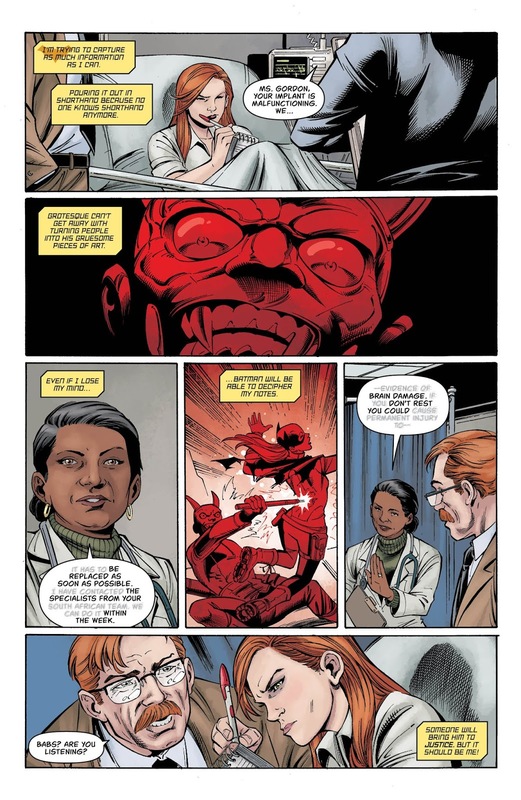 Hmm…this doesn’t only mean that the person in the Grotesque mask is a different person, but that the character itself may be a literary convenience! To clarify that point, the new Grotesque shows up, chats with Barbara for a bit, and then they duel, to Grotesque’s painful loss. Batgirl slams him against the ground and trusses him up, and just after contacting the cops gets all woozy like she did when she collapsed at the police department. Not wanting to pass out in full view of police officers, Barbara stumbles onto the fire escape and falls into a dumpster to ride out her high. Later, she wakes up and crawls from the garbage, back to the scene of the crime. 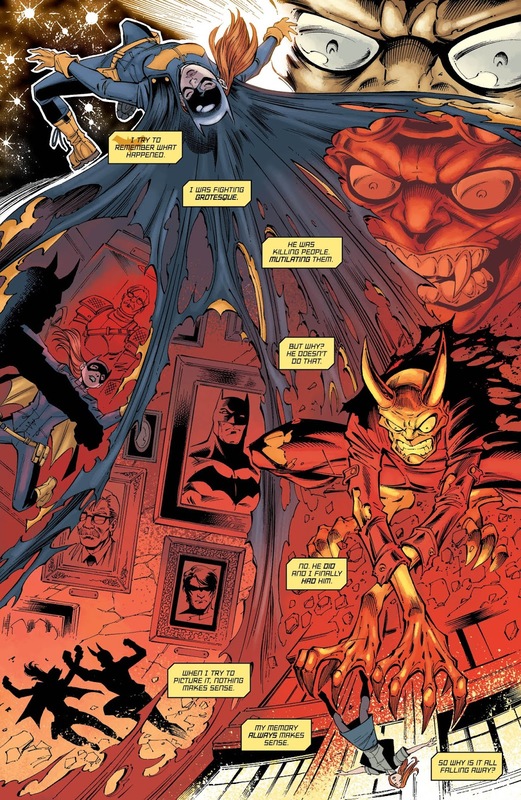 The cops are there, including a detective—who fingers Batgirl for the murder of Phillipe! Here we have a pretty compelling story: a mysterious antagonist who clearly knows more than he is letting on, a hero putting herself in mortal danger in search of justice—and one willfully searching for justice, not just stumbling onto truths by circumstance or accident. And of course, the gruesome murders. 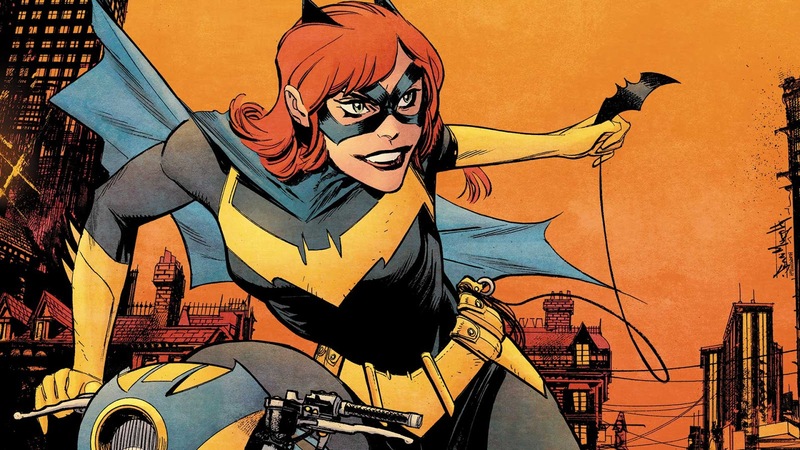 I love the way Barbara is characterized here, and I do like the new costume a lot (though it is reminiscent of the one worn by Bluebird aka Harper Row…remember her?) As for Barbara being in Gotham City, I can take it or leave it. I never really had an issue with Burnside, just the silly things that happened there. This is a quality comic book that should be pretty accessible to anyone with a reasonable knowledge of the Bat-world and its trappings. For the first time in a while, I find myself anticipating the next issue quite a bit. Batgirl behaves heroically as the mystery of Grotesque's grisly murders deepens, and I am enjoying the feeling of not knowing exactly where this story is going to wind up. Curious folks and lapsed Batgirl fans should take a look, this is gearing up to be a pretty intriguing series.